Well of Wisdom, 30" scapes, 6" flower, dormant, midseason, 6 way branching, 35 buds, tetraploid. ((SPANISH GLOW X HEAVENLY TREASURE) X NORDIC MIST). A beautiful cream white flower with a gold edge. 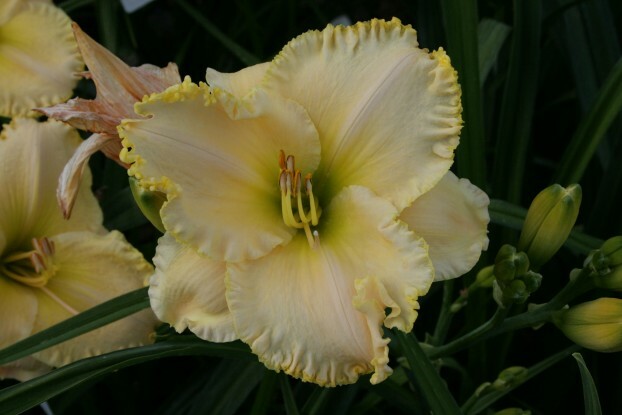 Similar to some other daylilies on the market, WELL OF WISDOM stands out because of its excellent branching, bud count, and hardy dormancy. Blooming is sequential giving a long bloom season. Occasionally blooms with a pink blush on the petal edges and is a wonderful parent for edges without eyes. Easily fertile both ways. Inquire.